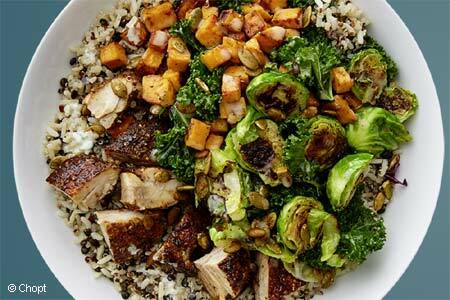 This trendy eatery offers some of the best salads in the metro area. : Someone somewhere figured out that Americans love salads and that a salads-only restaurant would be a winner. Hence Chopt, and in DC’s Chinatown-Penn Quarter district, it’s jam-packed at all hours. To add to its appeal, the listed salads are interesting combinations, sometimes even wacky ones. But you can design your own salad bowl with a choice of greens; add-ons such as beans, eggs and edamame, to list a few; meats and cheeses; crunchy garnishes and fruits. The price of your finished salad varies depending on selections. Chopt also offers several sort-of non-salad items, including “salad-sandwiches.” Part of the salad show includes watching the staff work their knives, or mezzalunas, to crunch up the greens and such into bite-size mouthfuls. Other locations.